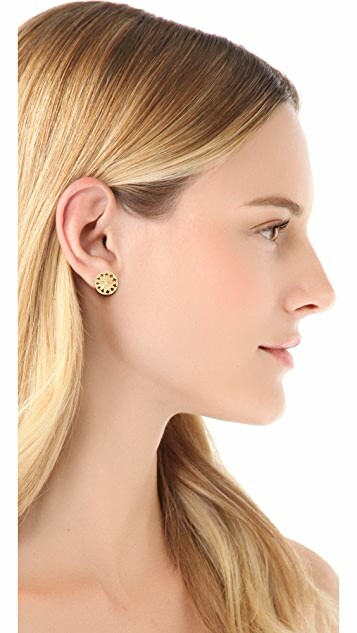 These 18k gold-plated post earrings feature diamond cutouts at the brushed disc detail. 1/2" wide. These are lovely but much more delicate and smaller than I was expecting. Even so, they are a lovely bright gold and are still large enough to make a nice impact. I have no doubt I will get a lot of wear from them. A bit expensive though, I probably wouldn't have bought if I saw them in a shop. I was really excited to get these earrings in the mail, and although delivery was super quick, I returned these earrings immediately. They were smaller then I expected and very thin, so they would bend out of shape quickly. Although they are very cute, definitely not worth the price. Very nice. The color's great, the size is perfect, couldn't have asked for more. these studs are very easy to wear. they are perfectly sized (not too big) and comfortably lightweight. You may need to take care though as I find the posts can bend out of shape a bit. Love these! They are the perfect summer accessory - especially for overnight stays, or traveling. They can be dressed up or down. Perfect size. 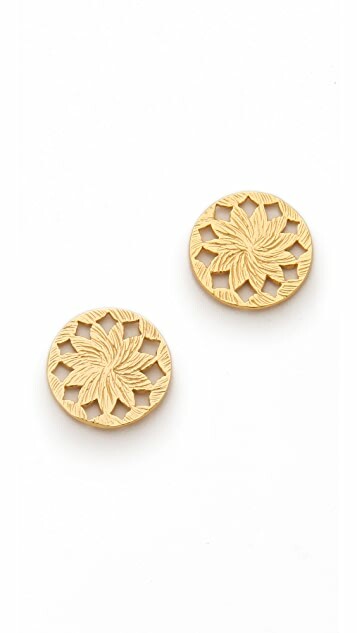 Beautiful earrings, although they do look like fake gold. A very good daily wear.